The Transit Exoplanet Survey Satellite has been in the works for years and in a way could be considered a sort of direct successor to the Kepler, the incredibly fruitful mission that has located thousands of exoplanets over nearly a decade. 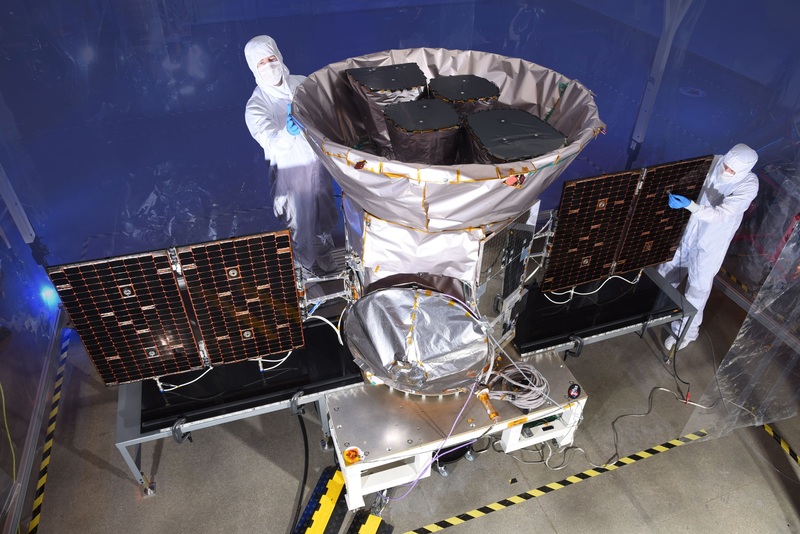 But if Kepler was a telephoto aimed at dim targets far in the distance, TESS is an ultra-wide-angle lens that will watch nearly the entire visible sky. They both work on the same principle, which is really quite simple: when a planet (or anything else) passes between us and a star (a “transit”), the brightness of that star temporarily dims. By tracking how much dimmer and for how long over multiple transits, scientists can determine the size, speed, and other characteristics of the body that passed by. It may seem like looking for a needle in a haystack, watching the sky hoping a planet will pass by at just the right moment. But when you think about the sheer number of stars in the sky — and by the way, planets outnumber them — it’s not so crazy. As evidence of this fact, in 2016 Kepler confirmed the presence of 1,284 new planets just in the tiny patch of sky it was looking at. TESS will watch for the same thing with a much, much broader perspective. Its camera array has four 16.4-megapixel imaging units, each covering a square of sky 24 degrees across, making for a tall “segment” of the sky like a long Tetris block. The satellite will spend full 13.7-day orbits observing a segment, then move on to the next one. There are 13 such segments in the sky’s Northern hemisphere and 13 in the southern; by the time TESS has focused on them all, it will have checked 85 percent of the visible sky. The little yellow patches are Kepler’s various fields of view. It will be focusing on the brightest stars in our neighborhood: less than 300 light-years away and 30 to 100 times as bright as the ones Kepler was looking at. The more light, the more data, and often the less noise — researchers will be able to tell more about stars that are observed, and if necessary dedicate other ground or space resources towards observing them. TESS being checked pre-launch; engineers included for scale. Of course, with such close and continuous scrutiny of hundreds of thousands of stars, other interesting behaviors may be observed and passed on to the right mission or observatory. Stars flaring or going supernova, bursts of interesting radiation, and other events could very well occur. In fact, an overlapping area of observation above each of Earth’s poles will be seen for a whole year straight, increasing the likelihood of catching some rare phenomenon. The launch on Monday will take place at Space Launch Complex 40 in Cape Canaveral. Once it safely enters space, the craft will receive a timely gravitational assist from the moon, which will insert it into a highly eccentric orbit that brings it close to earth about every two weeks. This unique orbit maximizes the sky that TESS can see, minimizes the effect of the moon’s pull, and regularly brings it close enough to send data home for a short period. So we can expect a sort of biweekly drip-drip of exoplanet news for quite some time. SpaceX is the launch partner, and the Falcon 9 rocket on which it will ride into orbit has already been test fired. 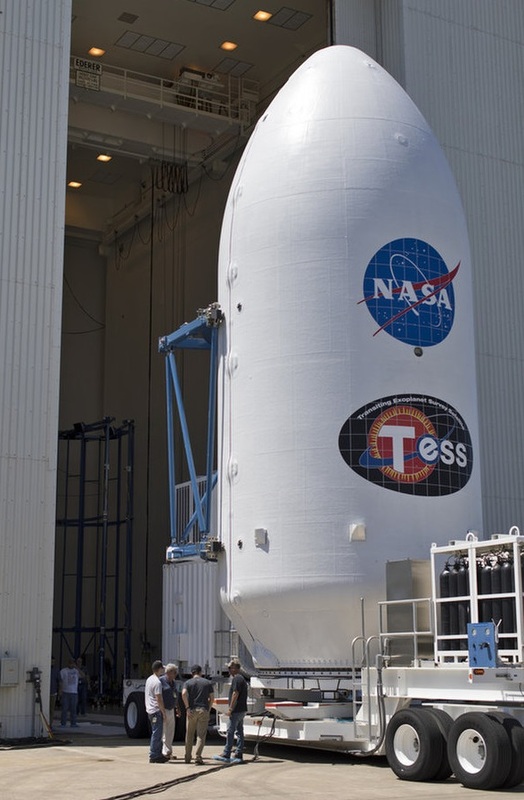 TESS is packaged up and ready to go, as you see at right. Currently the launch is planned for a 30-second window at 6:32 Florida time; if for some reason they miss that window, they’ll have to wait until the moon comes round again — a March 20 launch was already canceled. You’ll be able to watch the launch live, of course; I’ll add a link as soon as it’s available.